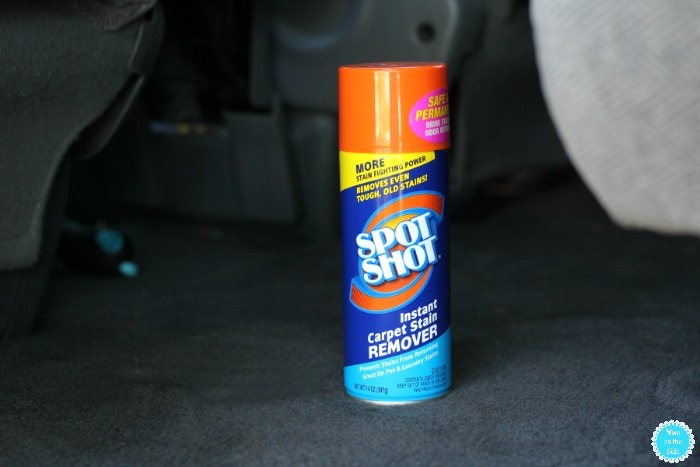 This post on Car Cleaning Hacks for Back to School is sponsored by Spot Shot ® Instant Carpet Stain Remover. Any opinions are 100% my own. Smelly shoes, crumbled school papers, candy wrappers, mud, and toys. That’s just a few of the things that make their way into a vehicle when you have kids. When school starts up, it can feel like never ending mess in the car. Just like I have a Weekly Cleaning Schedule for my house, I also clean our van weekly. Using these car cleaning hacks for back to school helps make that weekly car cleaning job WAY easier! Keep coffee filters in your glove box for dusting off the dashboard and interior. Pull one out while waiting to pick the kids up after school. Dust everything off, toss it in the trash, and you’re done! Speaking of trash, keep plastic bags in a tissue box and pull one out when you need it. Store the tissue box under the seat or in the glove box. Not only does this come in handy for trash, but also for soiled clothing and muddy shoes. Between muddy shoes and spills, carpet in vehicles can get just as dirty as the carpet in your house – if not dirtier. Keep a carpet stain remover handy so you can tackle those stains. Spot Shot® Instant Carpet Stain Remover instantly powers out old and new stains, including pet stains, coffee, spaghetti sauce, grease and oil, wine and more! Many of those stains find their way on to our vehicle’s carpet during the school year. Be prepared by clicking here to find Spot Shot at a retailer near you and here to save $1.00 on your next Spot Shot purchase. For more cleaning tips, follow the Spot Shot ® Instant Carpet Stain Remover! Do you proudly display a bumper sticker for your child’s school, but they’re at a different school now? Did you just purchase your child their first vehicle and it has old bumper stickers you want to remove? Blowdryers work great for bumper sticker removal. The warm air will loosen the glue and make removing bumper stickers less of a pain. Cupholders are mess magnets. Crumbs, dirt, dust, and spilled beverages take up shop in the bottom of cupholders. 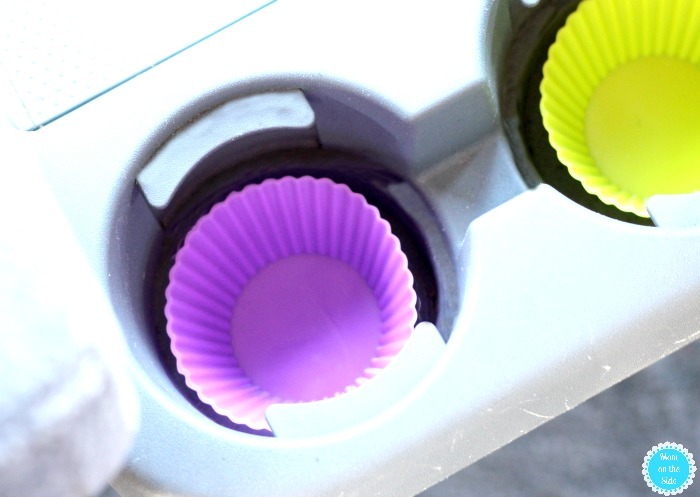 Keep them cleaner by putting cupcake liners in them. 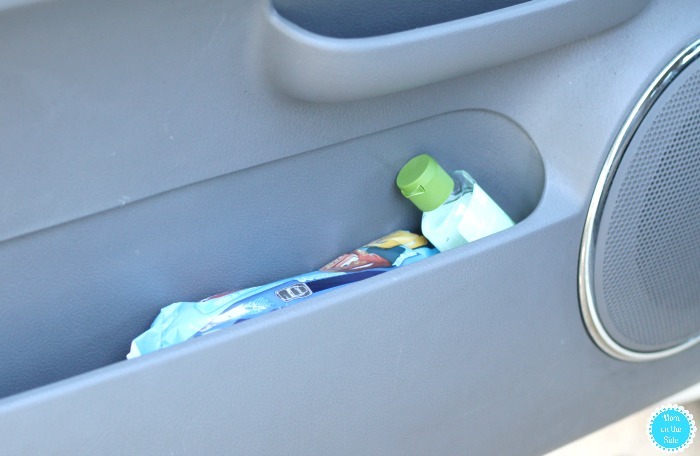 If you have a little cubby in your car door, store sanitizer and wipes in it. Especially if you have younger kids. They come in handy for cleaning up after playing at the park, visits to the ice cream store, or sneaking Halloween candy from the backpack on the way from school. Designate a day for once a week car cleaning. Gather all the trash, tackle any carpet stains, remove any toys and school items that were left throughout the week. We do this on Saturday so the van is organized, clean, and ready to go for another school week. 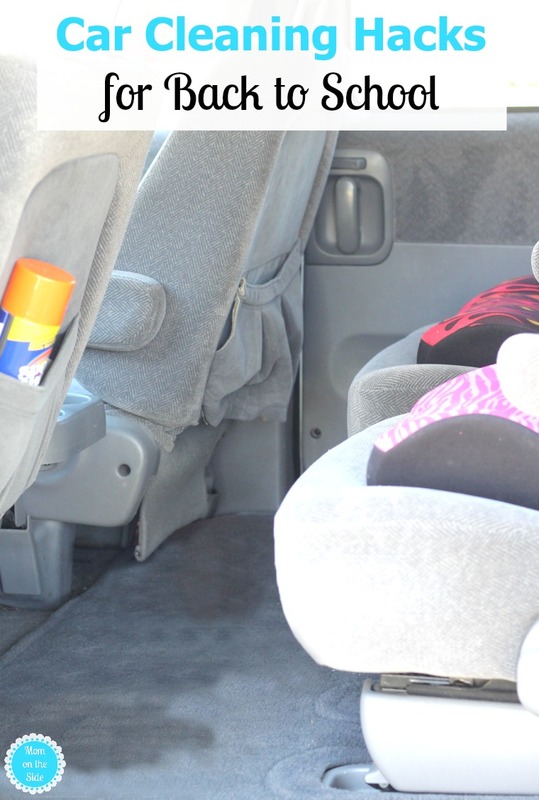 What other car cleaning hacks do you have for back to school?